How to make sound decisions you can live with. We are constantly confronted with decisions we never anticipated having to make. To complicate matters further, the timeframe for making a decision is often short and our options limited. So, what do you do when it's your move and you aren't sure what to do? 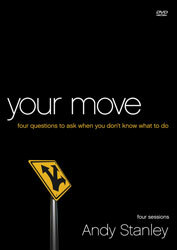 Andy Stanley offers four powerful questions that will help you determine your best move.